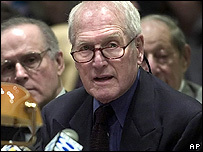 Actor Paul Newman has joined calls for the legislature in Connecticut to pass a law protecting image rights. Newman is among a group of actors backing a bill banning the use of a person's image or voice without consent for up to 70 years after their death. Newman, who lives in the state, told a state assembly hearing that technology meant he could appear in "a whole movie" without his permission. Opponents fear the bill will restrict filmmakers' rights of expression. 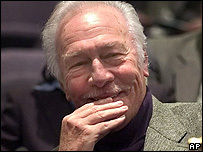 Newman, Sound of Music star Christopher Plummer and Midnight Run actor Charles Grodin, all appeared before the assembly's judiciary committee on Friday. Newman said inexpensive computer software made it possible to produce a new movie by re-editing the original. He said: "They could make a whole movie that looked like me, talked like me, acted like me, sounded like me, but wasn't me." Plummer said new technology had made it increasingly possible for people's image and voices to be used in material without any prior warning. "We are suddenly being cloned into something we're not," he said. "We are robbed of our individuality and our life's work is tarnished." The bill would forbid use of a person's "right of publicity" without proper consent for commercial purposes. It would take in a person's name, voice, signature, image and mannerisms. Nineteen other states have passed similar laws. The Motion Picture Association of America, which represents the major film studios, opposes the bill. Van Stevenson, senior vice president for state government affairs, said copyright laws already covered some of the actors' concerns. He added that the bill could prevent parodies of famous people and restrict filmmakers from using old footage. "Our position basically is, common law covers this," he said.